Welcome to Part 10 of the world eco-fiction series. 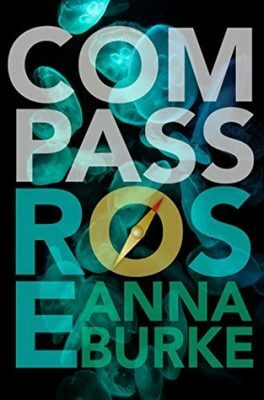 This month I spotlight Anna Burke and her novel Compass Rose (Bywater Books, 2018), a dystopian high-seas adventure that examines climate refugees, hanging ocean ecosystems, and ways humanity might adapt to rising, warmer oceans while also following the protagonist as she comes of age in an unforgiving—but highly relatable—world. The novel takes place in the future, in the West Indies. Its main character Rose was born facing due north, with an inherent perception of cardinal points flowing through her veins. Her uncanny sense of direction earns her a coveted place among the Archipelago Fleet elite, but it also attracts the attention of Admiral Comita, who sends her on a secret mission deep into pirate territory. Accompanied by a ragtag crew of mercenaries and under the command of Miranda, a captain as bloodthirsty as she is alluring, Rose discovers the hard way that even the best sense of direction won’t be enough to keep her alive if she can’t learn to navigate something far more dangerous than the turbulent seas. Aboard the mercenary ship, Man o’ War, Rose learns quickly that trusting the wrong person can get you killed—and Miranda’s crew has no intention of making things easy for her—especially the Captain’s trusted first mate, Orca, who is as stubborn as she is brutal. This swashbuckling 26th century adventure novel is smart, colorful and quirky, yet it manages to deliver a healthy dose of heart, humor, and humility on every single page. Most of us probably remember Hurricane Irma, which blasted through the Caribbean as a level 5 hurricane before hitting the mainland of the United States. If, out of concern, you might have watched news of the hurricane a little over a year and a half ago, you might remember as I do the small press coverage given to the Caribbean islands compared to that given to the hurricane landfall in the United States, yet many of the islands were absolutely devastated. Phrases like “horror movie,” “literally under water,” “barely habitable,” “warzone,” and “massive destruction” peppered the news that did cover the islands. Shortly thereafter, Hurricane Maria ripped through some of the same areas. Dr. Michael Taylor, a climate scientist in the Caribbean, talked about climate change and these two category five hurricanes in The Guardian. He stated, “Scientific analysis shows that the climate of the Caribbean region is already changing in ways that seem to signal the emergence of a new climate regime.” The new regime, he said, brings up three concepts that newly describe befallen areas like the low-lying islands of the West Indies: unfamiliar, unprecedented, and urgent. While hurricanes ravage homes, people, coastlines, crops, fishing, tourism, and more, it gets bigger than that. Tied with other (often related) environmental events such as tornadoes, rising seas and temperatures, over-fishing, over-development, death of coral reefs, pollution, disease, and so on–the ecological health of such areas is drastically changing, more so than is happening in many other regions in the world, giving us a glimpse into the horrific reality of global warming being a fact on the ground now, not just sometime in the future. My conversation with Anna Burke, below, talks about these issues, along with her experience living in Saint Kitts, LGBTQ themes in fiction, dystopian futures, weaving accurate science into fiction while still being entertaining with a good story, and world-building. Mary: What was your time like in the West Indies, and what is it like there now compared to the past? 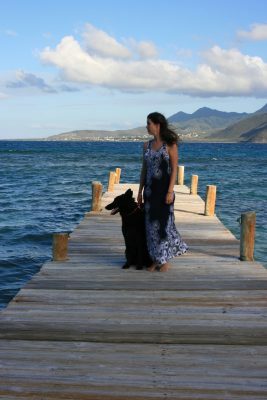 Anna: I spent two years living on Saint Kitts in the West Indies, from 2015-2017. The island has undergone a great deal of change in the last fifty years. It gained independence from the British in 1983, and since then transitioned from sugar production to tourism as its major industry. Both sugar and tourism are closely linked to the climate. The links between agriculture and climate change have been explored in depth by many experts, but what struck me most about living there was how dependent tourism is on the climate. I saw the effects of drought, storms, and climate change driven diseases like Zika on the Kittitian economy while my wife and I were living there, and between sea level rise and the increasing intensity of storms—we were there during the horrific 2017 hurricane season—it is honestly difficult for me to see how island nations are going to adapt and thrive in the face of an increasingly unpredictable climate. Mary: What motivated you to write a novel that tackles environmental issues? How important are novels that deal with climate change, do you think? Anna: I’ve always been passionate about environmentalism. I’ve worked in agriculture off and on over the years and have seen first-hand the effects of climate change in our food systems, but living in the Caribbean really drove home how vulnerable we are. Seeing an entire country at the mercy of not one, but two consecutive Category 5 hurricane will do that! Islands are microcosms of life on earth, and I felt very humbled in the face of nature’s wrath, for lack of a better way to put it. I had to channel those feelings into my writing. I think that novels that deal with climate change are essential. Not only do they raise awareness, but they can also prepare us for what is coming. It seems increasingly likely that we have passed the tipping point for stopping climate change, but rather than dwelling on that, I think that novels can help us mentally and emotionally wrap our heads around something as huge as the climate. Exploring our adaptability, ingenuity, and resilience, along with the technology that we do have, seems to me the best way to move forward, and books have always done that for us, whether it was predicting and fueling space exploration or helping us heal from conflict. Mary: Compass Rose is also a novel exploring LGBTQ issues. 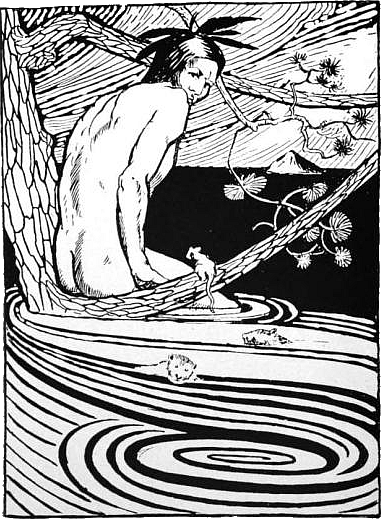 Is this still a niche audience, or do you think it’s growing–and can you talk about what’s happening with this in your novel? Anna: LGBTQ issues are still mostly niche, but I do believe that is changing. We’re seeing more LGBTQ characters in books, movies, TV, and now even in our elected officials, and I hope that trend continues because representation is so important, especially for young people. I include LGBTQ characters in my books partly for this reason, but my characters don’t really dwell on their sexuality. It is something that is a part of them and might influence who they are attracted to, but it certainly is not at the heart of the story. I am not downplaying the importance of coming out narratives, but I also think it is important for readers to see LGBTQ people (and people of color) having the same adventures and experiences as white heterosexuals. Sexuality doesn’t have to define their stories, and I think my work reflects that. I have had many straight readers tell me how much they’ve enjoyed my books, which I think is a sign of our changing attitudes towards minorities. Mary: One thing I noticed upon reading was that the novel is both heartwarming but scientific (for example, Rose’s knowledge of stars and the ocean) in a sense, and I think these two things go hand in hand very well. The story has more impact when messing with readers’ emotions. Do you think so? Anna: I certainly hope so! I like weaving science into my stories, but I know that as a reader I don’t like getting huge info-dumps, especially about complex issues, and so I try not to do that. I also think that separating science from emotion is a mistake. We interpret our world emotionally, even when we think we are being logical, and I like fiction that reflects that. Rose’s emotional connection to her navigational abilities helps her understand them and also helps her tell her own story. Mary: How did you research your novel as far as world-building? Anna: I love research. I regularly check out scientific blogs and research journals to stay up to date, and I love falling down internet rabbit holes. There is so much information out there, from interactive sea level rise maps and Google Earth to in-depth reports on jelly fish populations and 3-D printing technology. I did quite a bit of research up front about Rose’s world, and continued to research as I went along, adding and revising the more I learned. There are days when I wish I didn’t know quite so much about climate change, however, as so much of it is heartbreaking. I also had the benefit of living near the ocean as I wrote, which provided plenty of opportunity for first-hand experiences. Talking to experts is something I try to do as well. Researching a completely new topic is daunting, but an expert can help you focus on what is actually important. For example, I have never been on a submarine and knew nothing about sonar, and so I spoke with a Naval engineer to get the low down. Mary: Fascinating! Compass Rose is also a thriller and hard to put down. One reader described the book as a complete package–and it seems a glorious start for a debut novel. Do you have any other projects that you are working on? Anna: My second book just came out, and it is totally different from Compass Rose, although nature is very much a part of it. Thorn is a wintry fairy tale that deals with definitions of personal freedom and impossible choices, although I did use the research for the book as an excuse to watch an absurd number of nature documentaries about wolves and polar bears. After Compass Rose, I needed a break from hot climates, I think, and so plunged myself into an enchanted endless winter to cool off. I am also working on a prequel to Compass Rose and a sequel, although I do not have any hard deadlines. Working on multiple projects at once prevents writer’s block, and while at times it feels insane to have several novels going at once, it works for me! Mary: Thorn sounds pretty awesome, and I will be checking it out as well as your other novels in the future. Thanks so much for the chat! Raised in Upstate New York, Anna Burke graduated from Smith College in 2012 with a B. A. in English Literature and Studio Art. She holds a certificate from the International Writing Program at the University of Iowa and was the inaugural recipient of the Sandra Moran Scholarship for the Golden Crown Literary Society’s Writing Academy. She is currently pursuing her MFA in Creative Writing at Emerson College. Anna has lived all along the Eastern seaboard, but she wrote her debut novel, the high seas adventure Compass Rose (2018), while living on a small island in the West Indies. She suspects this explains her sudden interest in dystopian lesbian pirates. When she is not writing fiction, Anna is an overly ambitious gardener and freelance writer. She and her wife live with their two dogs and the occasional four-legged guest. Unlike her protagonist, Anna has no sense of direction.